There are no crack serial keygen etc for Astral Masters! Usage of cracks or keygens is bad for further game development. 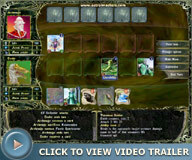 The game Astral Masters combines the best features of the computer game called Astral Tournament and collection card games. Two players compete in this turn-based game. Each of them fights against the opponent casting various spells and summoning fantastic creatures to his side. You can play either against the computer (both in single games and in tournaments) or against other people. Click here for description of some interesting cards. Copyright © Apus Software, 2004. All rights reserved.